Holy moly. Upset! Big political news out of Hawaii, where State Senator David Ige defeated Governor Neil Abercrombie in Saturday's Democratic primary, unseating the incumbent by a massive margin. Ige, who has served in Hawaii's legislature for 29 years, was still significantly unknown and underfunded compared to Abercrombie, but capitalized on the governor's rapidly declining popularity. Ige collected 66 percent of the vote, while Abercrombie received only about 31 percent. Abercrombie, who served in Congress for more than 20 years before his 2010 election as governor, is the first Hawaii governor to be defeated in a primary and only the second not to win a second term. Abercrombie, who has spent nearly 40 years in Hawaii politics, is the first Hawaii governor to lose to a primary challenger and only the second not to win re-election. His defeat comes after President Barack Obama last month urged residents of his native state to back Abercrombie, invoking the Hawaiian word for family in a radio ad, saying Abercrombie is "like ohana to me." 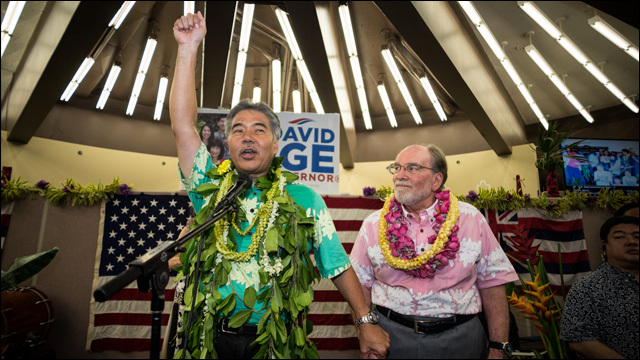 Abercrombie conceded the race to supporters, calling his four years as governor "a singular honor," then headed to Ige's election night party, where the two men, both adorned with leis, joined hands and raised their arms in the air on stage together. Pretty amazing, considering that Ige was outspent 10 to 1 in the primary, and lacked Abercrombie's high-profile support from the Democratic establishment -- including the backing of President Obama. But money and endorsements aren't everything. The people have spoken. Abercrombie is out. More here: Hawaiian Governor Loses Primary by Wide Margin; Senate Race Is Undecided.